In recent months Graham Beal has been working all but nonstop, speaking at community breakfasts and Rotary Club lunches, appearing at city council meetings, county hearings and fund-raising events, doing media interviews, conferring with political strategists. "I have not yet kissed any babies," he says, with a slight chuckle that turns into a sigh. Far from being a candidate for office, Mr. Beal is the director of the Detroit Institute of Arts, which, given the Motor City's reduced circumstances, is these days considered to be the hardest job in the museum world. He has successfully steered the DIA through troubled economic waters since 1999—replacing public support with private donations, taking a machete to the budget, raising millions for a much-needed renovation of its 1927 building, always operating in the black. All of that merely postponed the current crunch, though, and now he is aiming to save the DIA with a tiny tax on property in the three Michigan counties whose residents make up nearly 80% of its visitors. On Tuesday, voters in Wayne, Oakland and Macomb counties will vote on this so-called millage tax. The measure exacts 0.2 mill, or $15 a year, on every $150,000 of a home's fair-market value for 10 years. In return, residents will receive free admission to the museum and expanded programs for schools and seniors; the DIA would get $23 million a year if the tax is approved in all three counties, or virtually its entire $25.4 million operating budget, plus time to add to its operating endowment, which totals $89.3 million and provides about $3.4 million a year. If the millage is voted down, Mr. Beal says, the DIA would go into "a death spiral." How the DIA, whose illustrious and encyclopedic collection places it among the very top museums in the U.S., got to this point is a matter of history. Nearly a century ago, Detroit agreed to fund the DIA's building and operations and let patrons pay for art acquisitions and exhibitions. In the 1970s, with Detroit reeling from racial troubles and the auto industry's decline—the DIA actually shut down for a month in 1975—the state of Michigan stepped in. As recently as 1990, the state contributed more than 60% of the museum's operating budget, while the city continued to provide a token amount, 1% to 2%. But the cuts kept coming, and as of July 1 the DIA is receiving not a penny from the state or the city. As a result, the DIA has been asking donors each year to finance more than half of its operating expenses, a model that is simply not sustainable. It is one that resulted in part from bad timing and bad luck. In 1999, the DIA began a $330 million fund-raising campaign to bring the museum building up to modern standards and raise the operating endowment to a healthy $200 million. Contributions reached $230 million when a recession hit and—surprise—the DIA discovered that its two modern wings were loaded with asbestos. That cost $40 million to remedy, money that would have gone to the endowment. When the economy improved, the campaign was restarted with a $180 million goal, for a grand total of $410 million. Gifts reached about $350 million when the economy took another dive, in 2008. "We paid all our bills, and we have no debt," Mr. Beal says. But again the dreams of an appropriately sized endowment were postponed, and Mr. Beal and trustees again tried to figure out a long-term strategy to stabilize the museum's finances. "We looked at everything," Mr. Beal says, and settled on the millage idea. He had already reduced the budget to $24 million last year from $34 million in 2008—cutting staff by 20%, including core curatorial positions; moving to defined-contribution from defined-benefit pensions; eliminating many retiree health-care benefits; and trimming everywhere that could be trimmed. Last year, Mr. Beal also received permission to divert income from two art-acquisition endowments to operations, generating about $2 million each year for five years. And most of the $60 million raised in major campaigns since 2008 has gone straight to operations. Going for a millage, Mr. Beal says, "is the only realistic option." 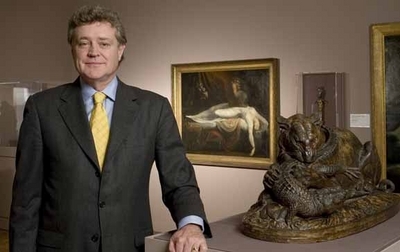 It would temporarily restore the DIA's "original business model" of public support, while an endowment campaign takes place for the long term—a fiscal-responsibility argument that Mr. Beal says is proving effective in its drive to sell the millage to voters. Economics figures heavily in the campaign, actually, with fact sheets noting how much the DIA spends in the three counties, which was more than $7.1 million in the past fiscal year. Mr. Beal also cites others—including L. Brooks Patterson, the Republican executive of Oakland County—who argue that the DIA is an economic-development tool meriting support. "The business community is behind us all the way," Mr. Beal says, noting that the voting is not breaking down along partisan lines. He characterizes those who oppose the millage as "no tax, no way" people. The DIA's case is strengthened by its broad collections, which have depth in American, contemporary and African-American art as well as European art. They were reinstalled in 2007 in a way that Mr. Beal says is "genuinely egalitarian," but which did not upset critics who defend art hierarchies. The galleries do offer more learning devices, but they generally avoid patronizing visitors. Mr. Beal says that polls and focus groups conducted for the campaign agreed that the DIA is for everyone. "We are a very important part of the quality of life in this area," he says. Passage is not a done deal, however, in this wobbly economy. A millage was proposed—and defeated—in 2000 and 2002. Then, however, it was pitched as a cultural tax for 17 institutions and was too high, $1,000 per household, Mr. Beal says. In 2008, the Detroit Zoo sought and won a 10-year 0.1 mill property tax in the three counties. The DIA actually wanted its proposed tax to run for 15 years, but county commissioners declined to support that term. If the tax fails, Mr. Beal says he'd have to cut the museum's budget immediately: laying off 70 people; closing on weekdays except perhaps Fridays; shuttering half the galleries; stopping many educational programs; and curtailing some temporary exhibitions. If it prevails, Mr. Beal says, "we will have 10 years to achieve the kind of financial stability we haven't had in 40 years."